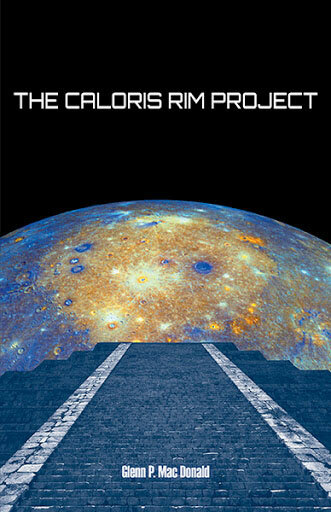 The Caloris Rim Project, by Glenn P. Mac Donald, is a hit and miss military/space adventure containing all the requisite elements: the hero(s), the love interest, the corporate/government conspiracy, rogue military operatives, and interstellar war. Mac Donald gets a lot of things right, but just as often swings and misses. He delivers some great action scenes and inventive alien species, but his characters often seem cut from a broad and stereotypical cloth. That's not to say I didn't enjoy the book -- I did -- but I enjoyed parts of it a lot more than I enjoyed others. I was left feeling as though I'd just read a lot more words than the story needed to be told. I had some problems keeping track with what was going on and why. About two-thirds of the way through, I sort of gave up on trying to figure out how the overall plot fit together and just followed along for the rest of the rise. It's as though there are two different books here. The story Mac Donald ended up finishing didn't feel like the same story he started. I think a good editor might have loped off the first third of the book and tightened up the rest, and it would have been better for it. It's the year 2250 and Major Frank Rawdon, a special agent working for the United States Space Command Intelligence Service, is sent to investigate allegations that Germany is committing Solar Exodus Treaty violations. This treaty requires any and all space travel research by both corporations and governments to be public. In other words -- no secret research. Rawdon, a combat expert and super spy extraordinaire (to the point of being a Gary Stu) gets arrested on Venus but manages to escape on spaceship. While on the spaceship he stumbles across a cargo hold containing hundreds of stasis pods, and in each stasis pod is a Turgor soldier. A Turgor is a giant, super strong, bioengineered top secret super soldier. Finding them so piques Rawdon's curiosity that he stows away inside one of the pods, waking up when the ship reaches Mercury. This adds an even odder twist to the whole adventure, since Mercury supposedly hadn't been visited for the past seven years. On Mercury, he uncovers a government/military conspiracy that runs deeper than any he's ever encountered, but even that pales in the face of discovering that the military has teamed up with a strange alien species called the Arbortruncae. Seems the Arbortruncae are in a bind. Their home planet and young are being pillaged by another species, one which, somehow, shares a common genetic heritage with humanity. This discovery throws Rowden for a bit of a loop, since it hints at the existence of spiritual and Biblical things our atheist hero has long since dismissed. Bip bam bow and he's caught up in an interstellar conspiracy and war that could threaten Earth itself. For a first novel, this is a valiant and successful effort that manages to fuse more than one genre: science fiction, space opera, military-action, thriller, and self-discovery. As I previously mentioned, there are some weaknesses. With few exceptions, the characters are fairly two-dimensional and the whole thing is in need of an aggressive editing. The big ideas Mac Donald tackles, are, for the moment, beyond his skills. But there are flashes of brilliance where it all works quite well. His inventive alien species are superbly done. His efforts to combine Biblical mythology and with one race's spirituality is noteworthy, and he writes some fantastic action scenes. If he can learn to maintain more consistency and connectivity through is story his story and plot, and make his main characters as interesting as some of his aliens and ideas, he'll be well on his way to even more success.